Chronic pain is no joke. It’s a debilitating condition for millions of people around the world. In the United States alone, 11.2% of Americans suffer from some form of chronic pain. That’s 25 million people who experience pain on a daily basis. Chronic, ongoing pain makes even the most routine activities challenging to get through. For this reason, people across the U.S. and around the world, are increasingly turning to alternative therapies to treat recurring pain. 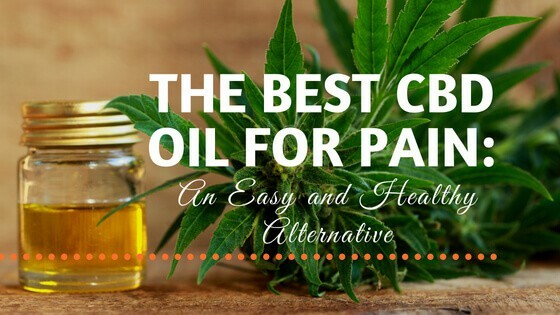 Keep reading to see the best CBD oil for pain, how to choose which CBD company to go with, and, if you're still on the fence, why you should be using CBD oil for pain. Cannabidiol, or CBD oil, is a naturally occurring compound found in the cannabis sativa family of plants. Both marijuana and hemp plants contain CBD, in varying levels depending on the strain. Cannabis contains hundreds of compounds called cannabinoids, many people are familiar with the most famous cannabinoid: THC. While both CBD and THC are cannabinoids, and each has beneficial medicinal properties, but only THC triggers the experience of a euphoric high. All other compounds in cannabis don’t have any connection to a psychoactive experience. This fact means CBD is a much more useful as an alternative therapy than high potency THC. How Does CBD Support Health? CBD is interesting (just like all other cannabinoids) because it seamlessly absorbs into our bodies. Cannabinoids work within a little-known system called the endocannabinoid system. This system is responsible for regulating a number of fundamental bodily processes, like our immune systems, appetite, memory, mood and fertility. It also regulates the sensation of pain. When working correctly, the endocannabinoid system aims to keep everything perfectly balanced, in a state of homeostasis. Each cannabinoid plays a different role in the endocannabinoid system, with some activating receptors while others inhibit them. CBD seems to play an inhibitory role, which is helpful for when the endocannabinoid system is overloaded and overreacting. Do People Already Use CBD for Pain? Cannabis is an ancient medicine, long used to reduce pain. But what about CBD oil for pain? According to a recent industry survey which asked people how and why they used CBD oil, pain is one of the main reasons. But just because people are using CBD in their personal self-treatment regime, does the research support it? Does the Research Support CBD for Pain? There have been dozens of studies, with over 1,000 participants (in total), on cannabinoids for pain. The research has looked into many types of pain, but the majority of the study was on chronic neuropathic pain. Most often its exploring THC for chronic pain, but some studies have started looking into CBD oil as well. There is definitely a positive correlation between THC and THC:CBD combinations for the treatment of pain, but what about CBD alone? There are already a handful of early studies which show CBD alone is useful in reducing inflammatory pain, neuropathic pain (in animal studies). Even if the research into CBD is in the early stages, it hasn't stopped anyone from using it to treat their own chronic pain. Still, more research is needed to determine the mechanisms through which CBD reduces neuropathic pain, cancer pain, and inflammatory pain. What we can draw from the research so far is that there is a scientific basis for CBD oil and the treatment of pain but the details still need to be worked out. As more and more people turn towards natural therapeutic alternatives, like CBD oil, to treat chronic pain, the research will need to catch up. Part of the reason why there is so much interest in cannabinoids like CBD oil for pain is due to the rising crisis of opioid addiction. New research on states with access to recreational and medical marijuana has shown that access to cannabis may reduce opioid overdose deaths and opiate addiction. People seem to be using cannabis as a replacement for the highly addictive opioids often used for the treatment of chronic pain. The more widely available marijuana is in the state, the more the state experiences a reduction in opiate addiction-related health issues. Beyond CBD for Pain, What About CBD for Opiate Addiction? Some research indicates that CBD might help with the traumatizing and debilitating withdrawal from opiates. One study found that CBD benefited two stages of opioid addiction, including the intoxication stage and the relapse phase. The research is still in its infancy, but based on the increasing issues with opioids, more is already underway. Why is CBD Impact on the Opiate Crisis Important? There were 236 million prescriptions for opioids in the U.S. in 2016. There were also 63,600 related overdose deaths in the same year. The majority of these prescriptions were issued for difficult to treat chronic pain. Cannabis, including cannabinoids like CBD, offer a safe alternative to these strongly addictive and sometimes deadly pharmaceuticals. CBD may potentially help people reduce their dependence on opioids, while also replacing them as a therapy for chronic pain. CBD could offer a two-fold benefit targeting pain and addiction. That's a tough question - because there are so many formulations on the market today. Many brands have come up with pain-specific lines, with a combination of ingredients, while others have developed CBD isolates. At the very least, there is more than one option out there, including capsules, tinctures, concentrates, edibles and topicals. Not every formulation works for everybody. Take your time to explore the brands below, to determine which product works best for your personal experience of pain. One of the main reasons why people dislike taking CBD oil, even if it lessens the pain, is because of the flavor. While it's not the worst tasting medicine in the world, it does have a very particular and earthy natural flavor. This natural flavor is why Pure Kana recently launched a line up of flavored CBD oil products, to help make it that much easier to swallow. The product line up includes a full spectrum CBD oil in mint. Many people have found it particularly useful for the treatment of difficult to manage pain. This includes managing arthritis pain, joint pain and back pain. As a full-spectrum CBD oil, it also takes advantage of the many other cannabinoids found in the whole-plant hemp extraction. In their 600mg extraction, CBDPure Hemp Oil delivers maximum benefit for the treatment of pain. Each serving equals approximately 20 mg each, a dose for those wanting to move beyond the minimum threshold of CBD therapy. Despite its CBD potency, CBDPure is safe to use even in this higher dose. According to the most recent analysis of the data, CBD has a solid safety profile, even during the high doses seen in clinical trials. Even using higher potency tinctures, like CBDPure Hemp Oil products, is just as safe as using the lower potency ones. It has an all-natural flavor, which means some people may want to disguise their daily dose in a smoothie or juice. Pumping up the potency once again is the Green Roads CBD oil in the 1500 mg formulation. This product, made from American grown hemp and compounded by a licensed pharmacist with two decades of experience. It is their highest concentration. These higher concentrations are perfect for those who have experience using CBD in the past, but determined through self-titration, that a higher potency is needed. For challenging daily pain, the 50 mg dose provided in this Green Roads product is a one of the strongest on the market. It makes daily treatment easy, because of the higher potency of dose. No more need to double up on the dropped, when one dropper will suffice. Sometimes it is easier to swallow the medicine whole instead of allowing it to absorb under your tongue, as is the suggestion with most CBD oil tinctures. The CBD Essence Hemp Oil Capsules is a simple way to add pain-relieving CBD into your daily vitamin mix. Each tiny capsule is packed full of 35 mg of CBD oil, sourced from organically grown, all-American hemp. It's a full spectrum extraction, which protects the many other sensitive medicinal compounds in the hemp plant. The capsules are a liposomal format, meaning they were designed to make it through the digestive tract without the deterioration experienced by other formulations. This means more medicinal compounds are available for absorption in the CBD Essence Capsules than with other non-liposomal formats. Charlotte’s Web may be one of the most trusted names in CBD, because they have partnered with the family of the girl who started it all, Charlotte. Through treatment with CBD heavy cannabis, Charlotte was able to drastically reduce the frequency and severity of her seizures, far beyond what conventional drugs had done. Now Charlotte and her family are working with Charlotte’s Web creators (the Stanely Brothers) to create a beneficial and more accessible line up of hemp-based products. Their hemp oil, in Everyday Advanced, is a perfect format for daily delivery of CBD’s anti-inflammatory and neuropathic pain targeting properties. It comes in both olive oil and chocolate mint flavors, helping to hide the earthy undertones of the CBD. Most people prefer to take their CBD oil in a tincture format, but one downside is that it can take a few hours to take effect. Some people even report it that CBD oil seems to build up over a few days before they experience any benefits. Part of the reasoning behind this is because tinctures (and capsules full of CBD oil) are absorbed through the digestive tract, which takes some time to complete. An alternative, if you want to treat acute pain with more immediacy, is to vape CBD oil. We recommend using a vape pen for CBD oil. Koi CBD Vape products come in many delicious flavors, including the Pink Lemonade, and Strawberries and Cream. Vaping CBD boosts the bioavailability of the medicinal compounds and also guarantees faster absorption through the lungs. If you need quick relief, a Koi CBD vape product may be right up your alley. Another liposomal product to help you get the most out of your CBD oil, and with the added bonus of all natural citrus flavor to help mask the earthiness. It’s helpfully designed with an easy-to-use oral spray, for discrete daily use. At a lower potency, it delivers roughly 5 mg of CBD per spray. If you are just getting started using CBD oil, and are unsure of the correct dose for your experience of pain, a low dose spray can help you settle on an effective daily dose. As you get used to using CBD oil, its easy to self-titrate up the perfect dose that hits the sweet spot to reduce any simmering chronic pain. The spray format is also handy when on the go, tucked into your purse or office drawer, its discreet enough to use while at work. There are always a handful of characteristics you want to look out for when shopping for CBD oil. The product should be full spectrum, it should be organically grown, and it absolutely must be lab tested. All NuLeaf Natural products, including the High-Grade Hemp Extract, checks all these boxes. With 50 mg of CBD delivered per dose, it's a safe yet potent reminder that all-natural solutions can still provide pain relief. This High-Grade Hemp Extraction has proven beneficial to customers not only pain relief but also as an all natural relief from anxiety and symptoms of obsessive-compulsive disorder. For American customers, they also always include free shipping on all orders within the U.S., something unheard of in the industry. If anyone knows what it takes to conquer sports-related pain, its Lawrence Taylor a former and legendary NFL superstar, known for making and taking big hits throughout his career. He has partnered with Diamond CBD to create a sports-specific product, targeting sports-related injuries and inflammation making it one of the best CBD oils for pain. As both amateur and professional athletes are well aware, the pain from old injuries lingers much longer than the injury itself. Diamond CBD’s specific Pain Master formulation is meant to target even the most difficult to treat pain. As with all CBD products, its beneficial for reducing inflammation related to injury and for neuropathic pain stemming from damaged tissue. Lawrence Taylor uses this to treat his daily pain, and he has likely taken much more a beating in his life than you. Using clean CO2 extraction methods, Endoca has produced 99 pure crystal CBD. CBD crystals, or CBD isolates as they are sometimes called, are a relatively new development in the cannabinoid market. They provide the strongest purity, without the addition of any other ingredients. It’s perfect for those who which to boost their CBD intake, perhaps while also using a higher THC strain of medical marijuana. It’s also useful for the creation of your own concentrates or edibles. While the format may throw some people off, they are perfectly safe to dissolve under the tongue like other CBD products but are of maximum purity. Rest assured, Endoca extracts CBD using only the cleanest methods, from 100 percent organic hemp sources. Their CBD crystals contain no THC. Another brand explicitly designing products for those living an active, and sometimes, painful lifestyle. Their unique blend of natural ingredients, healthy oils, and medicinal herbs target tight muscles, sore joints, and general inflammation as caused by physical activity. Beyond just the addition of pure hemp-extracted CBD oil, they also included other beneficial ingredients like avocado oil, MCT oil, and turmeric extract. These ingredients (and more) work together to reduce lingering issues with old sport-related injuries. They help active people recover quickly and effectively. No matter the level of daily pain, Receptra has prepared a specialized concentration including the Active with 15 mg per dropper, the Elite with 30 mg, and finally, the Pro for 60 mg.
Find the right dose of Receptra to meet your level of physical activity and experience of pain. A product designed with pain in mind. Verified CBD Pain Spray contains CBD isolate (99 percent), in a 60 ml spray along with a few other helpful and active ingredients meant to target pain. These helpful herbs and medicinal compounds include rhizomes and turmacin, both of which are known to target pain and inflammation. Two sprays, dosed twice a day, are all you need to help reduce the experience of daily pain. Their customers report benefits for knee pain, fibromyalgia, and sports recovery. They believe so firmly in the power of their product that they offer free worldwide shipping, and 30-day money back guarantees. Produced using only organic and GMO-free hemp from Northern Europe, SOLCBD has brought out the big guns with a 3600 mg format. It's a formula to target challenging chronic pain, pain which maybe didn’t respond to other treatments. Everyone’s endocannabinoid system is different, and many people may only respond to higher concentrated doses of CBD oil. SOLCBD’s 3600mg CBD oil contains three times more CBD than any of their other doses. Its a higher concentration, meant to deliver real results. Like all their other products, it only uses CO2 cold press CBD extraction and comes with third-party verified lab results. This formula has helped people with other issues, beyond pain, including Post Traumatic Stress Disorder, anxiety, and chronic inflammation. When it comes to cannabis, there are really only two names you can trust, Cheech and Chong. They’ve been in the business of cannabis for decades, and you can expect if they put their name on a product, it must meet their high standards. Chong has worked with Diamond CBD to produce another great CBD oil product, Chong’s Choice CBD Oil in 1000 mg format. It's entirely safe for use as a topical massage oil, an excellent method of reducing muscle soreness and joint pain. It can also be added into a vapor cartridge, for acute relief. Crafted using only high-quality natural hemp, its useful for not only the treatment of chronic pain but anxiety and recurring fibromyalgia as well. What's the benefit of treating pain through a CBD edible instead of with a tincture or vape product? Ease of use, and discretion. Nobody is going to think twice as you munch on a delicious gummy bear or two, no matter when you decide to dose. CBD FX’s Gummy Bears also cover up the natural flavor profile of CBD products, so you’ll never dread taking your medication ever again. Each gummy contains 5 mg of CBD, making it extremely easy to experiment with dose. Suggested serving size is two gummies or 10 mg. If two gummies aren’t enough, the next day you can try three. As with all Medterra’s products, the CBD Pain Cream is made with 99 percent pure CBD. None of their products contain any THC because they are made exclusively with CBD isolates. Plus, they’ve worked in other helpful pain-relieving ingredients to boost the medicinal benefit of the cream. These include arnica and menthol. The latter of which you’ll find provides intense cooling relief wherever it is applied. The CBD in all of Medterra’s products is grown and produced organically in Kentucky, making this an all American and entirely safe product. As a topical preparation, it’s especially useful during post-workout recovery, or when applied immediately before bed. Avid Hemp didn’t mess around with additional ingredients, flavorings, or packaging when designing this simple, yet effective CBD tincture. Sourced from 100 percent legal and organic hemp, it's a full-spectrum oil which takes advantage of all the chemical compounds of the hemp plant. The micro cannabinoids and terpenes, which are also increasingly linked to medicinal benefits, aren’t excluded from the final preparation. Instead, in Avid Hemp’s 1000 mg format, you’ll receive the synergistic benefit from all these compounds working together. Full spectrum hemp oils, like this one from Avid Hemp, take advantage of something called whole plant medicine. One of the main challenges of constant pain is finding real relaxation. When all you can think about is the ongoing pain, it’s impossible to think about anything else. What Diamond CBD was designed to do was to take that edge off. To reduce the pain, and to promote a broad sense of relaxation. Most report that the relaxation comes without sedation. Something most people with experience using sleeping pills or anti-anxiety medications can appreciate. Although relaxation isn’t the first property someone might look for when experiencing chronic pain, it can have long-lasting and surprising benefits. Fab’s CBD oil tincture comes in three different flavors, including all-natural, mint and citrus. Its simple delivery format makes it easy to dose and to increase dosage as needed. The reports of health benefits from this brand are encouraging for many health issues, including severe pain, relief of swelling, anxiety, and irritable bowel syndrome. Many customers report that their long-term pain was reduced for the first time in years after starting a daily regime of Fab CBD Drops. Fab uses only CO2 hemp extractions, and their drops come in two potencies - the 150 ml with 2.5 mg of CBD per dose as well as 300 mg with 5 mg of CBD per dose. Looking into CBD oil for pain, but nervous about making a massive investment? Kats Natural Heal is a perfect size, potency and price point for even the most frugal of shoppers. It’s also their best selling formula, using only CBD isolate sourced from hemp grown, harvested and produced in Tennessee. Within five days you should feel the benefits seeping into your sore muscles and aching joints. More serious issues may take up to two weeks to feel the full onset of relief. Kat’s Natural Heal CBD Oil is safe to use, even over long periods of time. Finding the best CBD oil for pain doesn't have to be difficult. You also need to be sure to stick to a CBD regiment. If you take it here and there, you won't see the benefits you will if you take it consistently everyday! Has and of these CBD products helped with you pain? Did we leave any out that have worked for you?